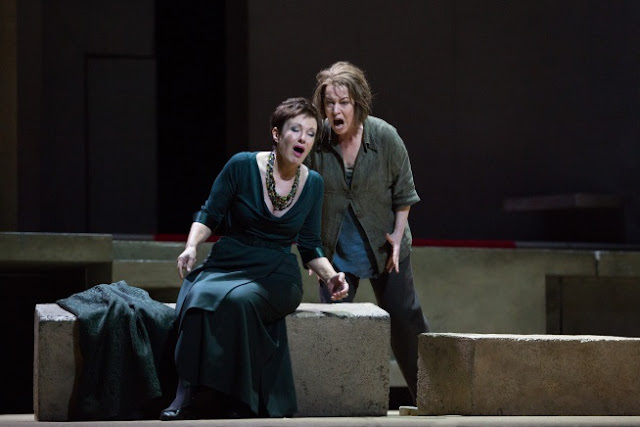 Two different performances of Richard Strauss' Elektra in the same month is a bit overwhelming. The first was at the Deutsche Oper Berlin on April 7. The second was the live simulcast from the Metropolitan Opera. I will not be able to help comparing them. The libretto is by Hugo von Hofmannsthal. We were told in the interviews at the beginning that this was probably the largest orchestra ever crowded into the Met orchestra pit. The simulcasts seem to find a way around any problems with the orchestra covering the singers. Both Esa-Pekka Salonen and Donald Runnicles are excellent conductors, though I have heard Runnicles many more times. There is not much to contrast about the productions. Both were drab, gray, modernized productions designed to emphasize the grimness of the story. Elektra, Chrysothemis and Orest are all children of Agamemnon, the chief commander on the Greek side of the Trojan war. While he is gone for 10 years fighting the war over Helen, his wife Klytämnestra takes up with another man. When Agamemnon returns, Klytämnestra and Aegisth kill him with an ax. Orest is banished, and Elektra spends her years wishing for revenge. The two productions reference the ax differently. In Berlin Klytämnestra enters using it as a cane, and she leaves it behind when she flees from Elektra who is threatening her. In New York Elektra brings the ax out of Agamemnon's tomb where she has been keeping it. I think the New York production follows the libretto more closely. It is clear there that Klytämnestra is making animal sacrifices to appease the gods. I thought for some reason that in Berlin she carried the ax around to kill people with it and don't remember a reference to animal sacrifices. She comes to visit Elektra to ask her what she must do to stop dreaming that Orest will come to kill her. What sacrifice must I offer? Who do I need to kill? Elektra's answer: yourself. In Berlin Klytämnestra and Aegisth were both killed at the back of the stage by Orest. At the Met Orest's tutor kills Aegisth downstage while Orest is offstage. For me the Berlin staging of the killings worked better. It's perhaps a tossup. In Berlin Chrysothemis was sung by a lyric soprano, while Adrianne Pieczonka is a dramatic and sang much heavier. She seemed to be auditioning for Elektra. Perhaps. I always love and respect Nina Stemme who was simply glorious. The intensity and drama carried throughout both productions. In Berlin Elektra dances and then dies. Occasionally you hear in the orchestra tiny hints of the Strauss opera which comes next: Der Rosenkavalier. I feel that I have had my fill of Elektra.